Cooking Class at Cooper’s Landing Inn & Traveler’s Tavern. Topic: “Tapas and the Art of Cooking Light & Healthy". The Perfect Mother’s Day Gift! Cooper’s Landing is the perfect getaway for those passionate about food and wine. Our Cooking School Classes blend relaxation, fine dining, and hands-on instruction all in a romantic and inviting setting. Join us in our Kitchen Classroom where each session will explore a specific topic, cover the basics, and then teach you how you can actually cook the food in your own kitchen. Come join the Chefs for our two-hour Monday night session where you will learn hands-on techniques in the kitchen that can be incorporated into your own home. You will be cooking & eating the night’s offerings along the way. All Monday night classes will be held from 6:30 – 8:30. We invite you to gather in the tavern at 6:00pm for a cheese & wine reception to meet & greet the other class participants. Price: $65 per person plus taxes. Price includes cooking instruction, cheese & wine reception, the courses you cook throughout the evening, cooking materials, and recipes to take home. After the wine and cheese reception, the Chef will make suggested wine pairings for each course we cook throughout the night. The paired wines can be enjoyed in class at an additional cost. 801 Virginia Ave, Clarksville, VA.
We invite you to gather in the Tavern at 6:00PM for a cheese and wine reception to meet and greet other class participants. 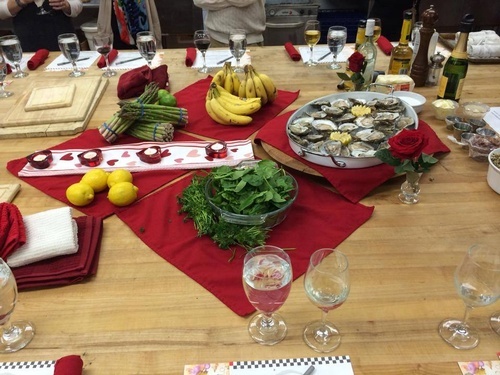 Price includes cooking instruction, cheese and wine reception, the courses you cook throughout the evening, cooking materials, and recipes to take home.